To start out the new year, it is important to continue exploring ways to keep our chakras cleansed, balanced, and healthy. Alberto Villoldo, Ph.D., shares the following simple chakra cleansing technique in his book: Shaman, Healer Sage – How to Heal Yourself and Others with the Energy Medicine of the Americas. 1. Hold your left hand at the base of your spine. 2. At the same time place the fingers of your right hand three or four inches above the location of the Root Chakra. (See illustration). 3. Rotate the Root Chakra with the right hand fingertips in a circle, spinning the chakra counterclockwise three or four times. (imagine your body is the face of the clock). 4. Rinse your fingers in the water. 5. 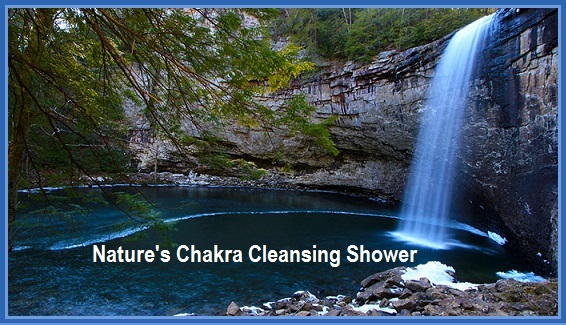 This eliminates the sludge and toxins that adhere to the walls of the chakra. 6. Repeat for all seven chakras, making sure to rinse your fingers thoroughly after completing each chakra. (The approximate location of the Sacral Chakra is the width of three fingers below the naval and the Solar Plexus is approximately the width of three fingers above the navel). 7. Next go back to the Base Chakra and spin it clockwise three or four times. Repeat for all seven chakras. 8. This exercise increases the speed of the chakras, allowing each energy vortex to spin at its optimal frequency. 9. These clean chakras are able to draw in natural energy to help keep us in exceptional health.